So far, we’ve examined the basics of what it means to eat organic food: no added synthetic pesticides and other chemicals. We’ve also learned about the use of pesticides on non-food items like the cotton that will be used to make our clothes. Bottom line is: synthetic chemicals are used in various forms of productions and not good for us. So you’re still not convinced buying organic food and organic non-food items make a difference? Hopefully this will change your mind, or at the very least open your mind and make you aware that every purchase has a consequence, whether we want it or not, and yes, you get to use each and every one of your dollars (or euros, or yens, or rupees, or pesos, or whatever money you use) to vote for what you want. Each vote tells the corporations and governments what it is that you, the customer, want. All of these toxic synthetic chemicals are not only bad for humans and animals who eat them/are in contact with them, they’re also really bad for the environment (fauna and flora) and the water sources (the stuff we all need to live!). See, what happens is that all those chemicals (synthetic fertilizers, pesticides, herbicides, insecticides, etc. etc.) end up polluting not only the air and the soil, causing a faster erosion, but with the rain, ends-up polluting anything around it for hundreds of kilometers, getting into rivers, lakes and aquifers (clean drinkable water). Massive amounts of synthetic fertilizers have destroyed the ability of the land to absorb the excess nutrients, instead of the natural slow absorption. This causes flooding, especially in fields, and it made farmers dig an enormous draining system of gutters to evacuate extra water, which in turn takes all this extra water full of chemicals directly to lakes and rivers even faster and in larger quantities. I’ve seen a documentary recently (David Suzuki’s Nature of Things) about Lake Winnipeg, the World’s 3rd largest water reservoir for drinkable water, located in northern Manitoba, Canada. 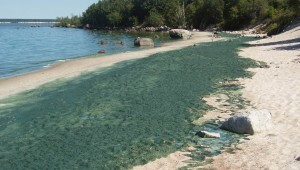 It is now being invaded with toxic blue-green algae because of too much phosphorus getting into it, because of its location, it gets runoffs from all around Manitoba, Saskatchewan, Ontario and even part of the U.S. There are many sources of (synthetic) phosphorus that end-up in our rivers, lakes and water supply: detergent, sewage, intensive pig farming and fertilizers from conventional (non-organic) agriculture. Those toxic chemicals have a devastating effect on the fauna (including all the bees that are dying) and flora, destroys precious filtering plants like cattails in marshes and wetlands, which Dr. Gordon Goldsborough, biologist at the University of Manitoba, describes as “nature’s kidneys”, the “last line of defense”. Without these marshes/wetlands, the effects are even faster, like a snowball. I strongly encourage you to watch this 10 minute video from Dr. Goldsborough talking about Lake Winnipeg, explaining what coastal wetlands are and why you should care about it. It’s not a high budget video obviously, but the information is great and the few pictures say a lot. support organic agriculture in all its forms, crops and animals (meat, dairy, eggs), food and non-food items, as agricultural pollution is the biggest contributor to this very important issue. Round Up is an herbicide, not a pesticide. Fabulous article, ECP!!! I am SO proud of you! Reblogged this on The healthiest beauty blog.